RAM is an intriguing component, fast, efficient and volatile (Volatile meaning, that once the power is gone so are the contents of RAM) its interesting to me primarily because several decades ago there was no distinction between electronic storage and RAM. Memory was simply were your programs went to get executed, and while that is still true today, we use sophisticated electronic components to store our programs and not punchcards and tickertape. 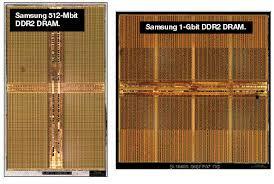 Intriguingly, Modern storage devices like SSD’s have more in common with RAM than they do their storage origins. It is fascinating to me how technology seems to go round in circles. All things in technology are created to serve a specific purpose, RAM was envisioned as little more than a method by which an electrical charge could be monitored and/or modified or re-routed. As such the simplest representation of a single bit of memory is a switch. 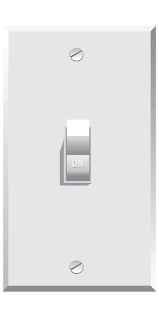 A Switch generally has two positions and those are fairly obviously on and off, either a 1 or 0. Memory and logic circuits generally have three, and those three positions are best thought of as a rocker switch mounted on a pivot, much like a sea-saw. When the switch is in the centre this too is a valid state indicating that there is nothing here. Flip the switch one way and the electrical charge passing through it may represent a 0, flip it the other and the electrical charge may represent 1. But while the switch is in the middle position it indicates that it is available for use. This is important to bear in mind since from the perspective of a computer 0 isn’t nothing it is, as equal as a 1 since this is the case it becomes necessary to indicate which switches are in use and which are not. However, it is not enough to know if a switch is in use or not, you have to know where it is located. Much the same way that a house has an address, so to do the registers that comprise memory. But why is this necessary? Well lets imagine a CPU without an addressing component, and we’ll represent the CPU as a kind of postman only in our case the postman is blind. instructions as to where the mail must go are written on the envelope but he cant read them, nor can he see the numbers on the building. in this state mail may get delivered to all the wrong addresses, it may get delivered to the same address or it may simply not get delivered. By introducing an addressing system we inform the CPU, not simply details about the amount of RAM available but how it can be accessed. Through the combination of both addressing and relay switching technologies the earliest forms of modern RAM came in to being. The earliest computing devices were warehoused sized and where an interesting fusion of electrical and mechanical components. RAM was no different, however the earliest devices bear very little resemblance to their modern day counterparts. Drum memory was a form of storage developed by Gustav Tauschek in Austria in 1932. This type of storage device became widespread throughout the 1950’s to 1960’s as the main memory storage and working device for early computers of the era. It was also not un-heard of to use these devices as secondary storage much like a modern hard disk. The drum itself got its name because of its shape. A large Metal cylinder coated with a magnetic material. 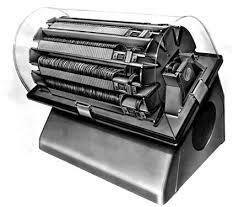 Best thought off as the precursor for modern hard drives and rather interestingly shaped very similarly to the wax cylinder’s that early music recordings were made on. Much like the early musical recordings of the 20th century a desire on the part of the customers for longer and higher quality recordings led to the creation of disk based Vinyl storage media, so to would the Drum Memory device be replaced/superseded by disk based storage devices. These early devices were also known for their size and the complexity of retrieving data from the device which required an intimate knowledge of how information is stored physically on the device. These devices were often slow and often the computers that used them were usually complemented with Vacuum Tube Triodes. However, such vacuum tube arrays were extremely expensive and amounted to little more than a few hundred bytes of storage. Extremely delicate and costly to manufacture, they were equally delicate and costly in operation. 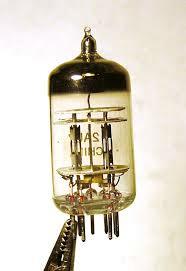 The vacuum tube was the fastest form of memory available at the time, however logic arrays constructed with tubes were sizable and too costly for large quantities of storage. data stored within each tube was represented as different chargers measurable against the different input/output pins of the tube. It wasn’t until 1946 that Freddie Williams and Tom Kilburn developed Williams-Kilburn tube. The Williams-Kilburn tube refined Cathode Ray Tube technology to a point where it became possible to use it to electronically store binary data, However as devices built around the Williams-Kilburn tube aged, they became increasingly unreliable. Such devices would require ‘tuning’ by hand in order to restore their functionality or in instances were this was no longer possible, expensive component replacement would be required. In the end the issues of scale and reliability had to be addressed and in 1947 the were. 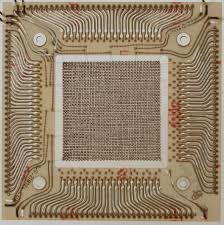 From the 1950’s Magnetic Core memory was the predominant form of RAM until the mid-1970’s. It is built using minuscule magnetic rings into which a wire was threaded to write and read information stored in the core. Each core represents one bit of information and the cores can be magnetized in one of two different directions the direction indicates whether a 1 or 0 is stored in each bit. Such memory also resembles a weaved cloth which is not too far from the truth. However it should be noted that this structure is closer to modern circuitry than the electromechanical origins of computing. However this type of memory was extremely sensitive to temperature variations since it relied on electrical current to set the state of each core. 32Kb of this type RAM would cost you around $3,000 in 1980. Although devised in 1958 the role of the transistor in memory circuitry wasn’t fully realised until 1968when Robert H Dennard invented Dynamic Random Access Memory. this invention allowed Dennard to replace 6 transistor latch circuits with a single transistor for each memory bit. This increased the density of the circuitry reduced costs but also increased volatility. Welcome to the modern era of Computer memory. In a future article I will cover the differences in modern RAM – DDR speeds and so forth. I hope this has been a useful article on the historical development of one of the most important components in electronic devices.